Yamaha C5X Conervatory Classic 6'7" Grand. ( Avialible Finishes ) Polished Ebony , Satin Ebony , Polished Mahogany. Designed primarily for performance, recording, and music school use. The Yamaha C5X provides the volume needed by both conductors and performers, giving a deep, resonant sound. 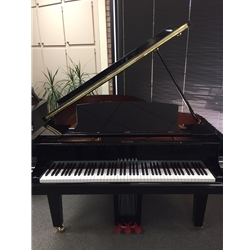 Conservatory Collection Grand Pianos have long been the heart of the Yamaha grand piano line, offering superb sound, broad dynamic range and fine expressive control. Built to the highest standards to assure lasting performance quality and value.